Arsenal midfielder Jack Wilshere gave Arsene Wenger a selection headache ahead of the Champions League tie against Monaco on Wednesday after missing training today, according to the Daily Mail’s Sami Mokbel. Krystian Bielik training with the #AFC first team this morning. 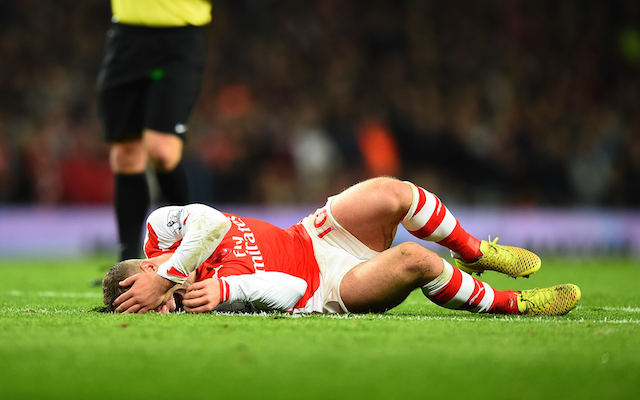 Jack Wilshere not out here, but told there’s no setback with the ankle. It was thought that the England man would be available for the game considering that he was named on the substitutes bench at Selhurst Park against Crystal Palace. Wenger has previously stated that Wilshere is ahead of schedule, but he hasn’t featured yet despite returning to full training earlier this month. It is reported that Wilshere will not feature on Wednesday, but the club have informed reporters that he hasn’t suffered a set-back, which raises questions as to why he was on the bench on Saturday if not fully fit. Following Aaron Ramsey’s hamstring injury Wilshere’s return seemed timely, but it appears as though Gunners’ fans will have to wait a while longer to see the return of the academy product.